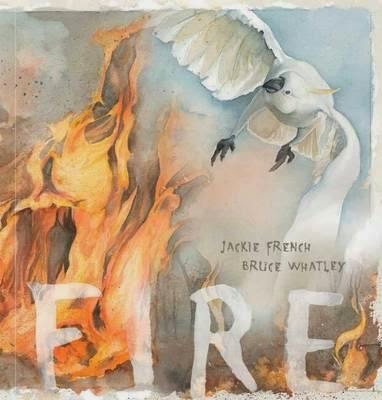 Jackie French and Bruce Whatley have once again produced a beautiful, evocative and powerful picture book where text and illustrations blend together creating a moving experience. Fire is a simple story, told in smooth rhyme, of a bushfire, hungry and intense, sweeping across the land. It speaks of the brave fire-fighters, the affected people and the cyclical nature of our earth. Gulping smoke and singed debris. Safety from the flame-fed land. The words themselves force you to slow down. The illustrations are amazing. The way the fire has been captured, with flicks of paint adding to the swirling ash and dirtiness of the landscape, creates a tense atmosphere. Whatley’s illustrations capture emotions, the panic, the claustrophobia, choking fullness of the fire and the poignant grief and despair of the aftermath. The ending, full of hope and regrowth, balances the story nicely. As does the cockatoo, through whose eyes we see the beginnings of the fire, and the beginnings of the recovery. Facing each high blazed attack. For young and old, this picture book will encourage many important conversations - fire, living in the bush, and the cycles of nature, among others. I would encourage older children to read it too. Fire shows beautifully how poetry, words and images can create incredible emotion. And anyone who has been close to such an experience (and bushfires are not uncommon in Australia) will relate to this story. Hi Sue, If you can't sleep at least you can't go wrong with a Jackie French book!